The church building was designed by Honolulu architect Guy N. Rothwell, who also designed the Gym (orignally also used as the Parish Hall) and Memorial Church School Building. It was completed on December 6, 1925, and contains many items of historical interest. The building utilizes the native lava rock stone in its structure, and features magnificent stained glass windows. Click HERE to read about the different stained glass windows, altar and other historical features of the church. The Rectory was actually the first building completed on the property in June 1925, and became the home of the Rev. and Mrs. Henry Willey, first Vicar of All Saints' Church. The much beloved Willey’s welcomed many groups into their home for meetings, dinners and friendly gatherings. During the war Mr. and Mrs. Willey hosted after church luncheons for servicemen stationed on Kaua'i to make them feel they had a home away from home. The Vestry and the Women’s Guild met regularly at the Rectory in years past. The gym was built in 1929 and has served All Saints’ Church and the community in many ways. Over the years it has served as a Parish Hall complete with a kitchen serving church dinners for up to 300 guests, a theater for shows and pageants, Sunday school classrooms, an International school, a meeting place for community welfare programs and dances. An annual free Thanksgiving luncheon has been held in the gym in recent years, serving over 500 delicious turkey meals each year. The gym also houses the Hale Lani Christian Store, a retail store that is run by volunteers of the church. As a gym, a variety of sports are played in the building including basketball and volleyball, and is also home to the Fun in Fellowship Dodgeball Tournament, a highly popular summer event that attracts people from around the island, state and mainland. The gym has also been rented for different classes such as aerobics, hula and ballet. This building was dedicated Thanksgiving Day 1958, to be used as the final resting place for urns containing the ashes of Henry Alpheus Willey (December 21, 1887 – January 4, 1958), his beloved wife Juelle J. (1888 – 1965), and our many other loved ones. 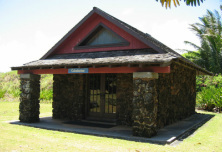 The use of the property on which the Columbarium and cemetery are located was acquired in 1955 by means of a trade with Lihue Plantation for the church’s Wailua Cemetery property. The new cemetery was dedicated on Memorial Day 1955, when the move of the remains from the Wailua cemetery was completed. Then in 1973 the church received a gift from the H. D. Sloggett Memorial trust of the half-acre of land on which the cemetery and Columbarium are situated. The Episcopal Church in Hawai'i began in 1862 when King Kamehameha IV and Queen Emma invited the Church of England to Hawai‘i. The King and Queen supported the Church's establishment throughout the islands with gifts of land, and by founding the Cathedral of St. Andrew in Honolulu. Queen Emma also founded Queen's Hospital (now Queen's Medical Center) and St. Andrew's Priory School for Girls in Honolulu. All Saints’ congregational history can be traced back to the arrival of the Rev. Henry Alpheus and Mrs. (Juelle J.) Willey on Kauai, on October 28, 1924. The church was founded as a mission of the Episcopal Church, declared itself an interracial church, and chose its name by a vote of the congregation. It became the first Anglican Church on Kaua'i. During the next few months, while laboring under unfavorable circumstances in Kealia, Rev. Willey succeeded in obtaining land and making plans for the church in Kapa'a. Mr. and Mrs. Henry Digby Sloggett gave the approximately five acres of land that would house the church, and in December of 1925, All Saints' Episcopal Chuch was completed. In 1962, the mission achieved parish status under the leadership of the Ven. Charles T. Crane. This building was formally dedicated on November 12, 1939, and was used for the church school service, providing a place for three of the seven church school classes held Sunday mornings. Confirmation classes, young peoples’ forums, lectures, and meetings of various sorts were also held here. Although it was often referred to as “the chapel” for short, it is not a formally consecrated building. Now referred to as Memorial Hall, it is used for meetings and houses the Sunday school and nursery. The tower is a memorial to David K. Hayselden, who served on the vestry for many years. It houses the church bell which is rung each Sunday. The Founders’ Porch that leads into the building is divided into three bays. The central bay is dedicated to Her Majesty, Queen Emma of Hawaii, “through whose instrumentality the Anglican Church was brought to the Islands,” and is the gift of the 'Iolani Guild of St. Andrew’s Cathedral. The right bay commemorates Capt. James Makee, founder of the industrial life of the Kawaihau District. Capt. Makee began the cultivation of cane and the manufacture of sugar in the Kapa'a area. His granddaughter, Wilhelmina Tenney of Honolulu, gave this bay. The left bay is a thank offering for “the loving service rendered to the people of Kauai” by the Rev. Marcos E. Carver, the first resident Episcopal priest on Kauai in the early 20th century who labored here from 1917 to 1925. It is the gift of several of his Kaua'i friends. The Sloggett Center building was dedicated in February 1980. Its four wings around a central courtyard houses the Church office, kitchen, large meeting room and the classrooms and restrooms for All Saints’ Preschool. All Saints’ Preschool was originally started in 1966 as a preschool for church members’ children only. It was located in the All Saints' Gym building with a staff of two. A few years later it expanded to include children from the community, using the Memorial Hall building. Today, it is housed entirely in the Sloggett Center with a capacity of 49 students and a staff of ten. It serves as a day school for children ages three to five years, and is licensed by the State of Hawai'i.